The laparoscopic ('keyhole') gallbladder operation is done under a general anaesthetic. A telescope is inserted at the umbilicus (belly-button) so as to give a complete view of the abdominal organs. The operating instruments are introduced under direct vision through three further 1 cm incisions on the abdominal wall so that the operation can be carried out. Using these instruments the gallbladder is dissected and eventually removed. 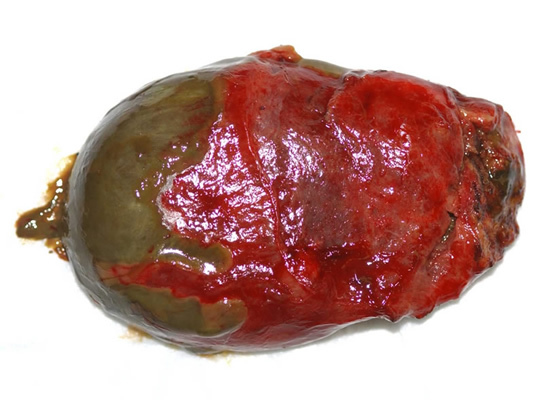 Gangrenous gallbladder removed at laparoscopic (keyhole) cholecystectomy. 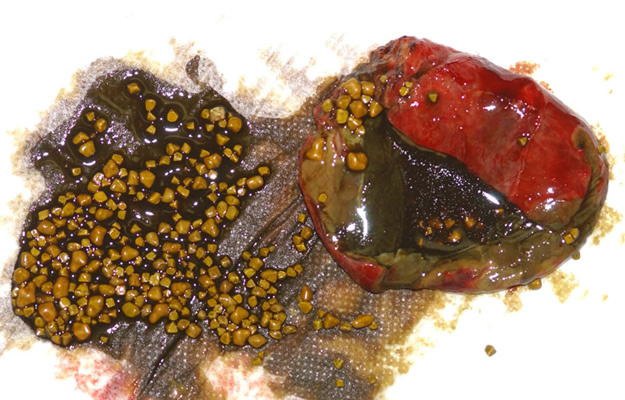 Gallbladder removed at laparoscopic cholecystectomy cut open to show multiple stones. During the course of the operation a tiny catheter (plastic tube) is also introduced and an x-ray is taken of the bile duct, which is the tube that carries bile from the liver to the bowel. This x-ray is carried out to make sure that there are no stones within the bile duct and that the anatomy is normal. The operation normally takes between 40 and 80 minutes to carry out. Provided the operation is completed by 'keyhole' surgery the patient will be in hospital for 1 night after the operation. In addition there is a 1 in a 1000 risk of injury to the bile duct and this would require open surgical repair. In up to 2% of patients the operation cannot be carried out by the 'keyhole' method because of inflammation or unusual anatomy and under these circumstances the operation needs to be converted to the 'open' gallbladder operation with a formal long incision on the abdominal wall. There is no way of predicting which patients will need 'open' surgery. It will only become apparent once the 'keyhole' operation has started that the operation cannot be carried out 'keyhole' and that conversion to 'open surgery' is necessary. A proportion of patients undergoing 'keyhole' surgery are suitable to have this surgery done as a day-case. Provided that the operation is carried out in the morning, patients may be ready to go home in the evening of the same day. Although most operations may be followed by discharge on the same day, occasionally patients are not fit enough to return home the same day and need to stay in hospital overnight.